Liverpool boss Brendan Rodgers thinks there is more pressure on Manchester City as the two Premier League title rivals prepare to meet next weekend. Rodgers' side are two points clear of Chelsea at the top after Sunday's 2-1 victory at West Ham. City, who beat Southampton on Saturday, are four points behind Liverpool in third, with two games in hand. "They have invested to win the Premier League and the Champions League," Rodgers said. "They will be looking to get a result next Sunday. For us, we are just going to enjoy it. "We know it's a big game. But in the big games this season, we've tended to do well." 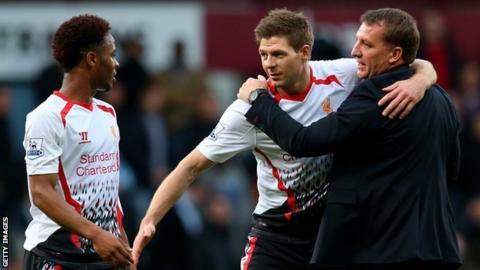 Liverpool secured a ninth successive Premier League victory as they won at Upton Park. And they are closing in on a club record of 12 straight league wins, set between April and October 1990. Rodgers' side are the only top-flight team yet to lose a league match in 2014, putting together an unbeaten run of 14 games. City captain Vincent Kompany said on Saturday's edition of Match of the Day that Liverpool were the best team he had faced this season. Rodgers has yet to beat City since taking charge at Anfield in June 2012, with both of last season's league meetings ending 2-2 before Liverpool were beaten 2-1 at Etihad Stadium on Boxing Day this term. The Liverpool manager said: "It was interesting to hear what Vincent Kompany said. We should have won there earlier this season, we should have won there last season and we should have beaten them at Anfield last season too. "The mentality here is to be fearless. We will respect the opposition, but it's about ourselves. "We give young players a chance and there's no pressure on them. I will take the pressure. "Our aim is to focus on the ball and the team. If we do that, it will take us a long way." Next Sunday's meeting between the sides will be a key fixture in the race to win the Premier League race, but Rodgers played down the idea of it being a title decider. He said: "I think there are a number of great teams in this league. "Manchester City have got some wonderful players. Jose Mourinho and his Chelsea side are always going to be there. "We're just embracing whatever pressure there is supposed to be. There are no nerves for us." The City game - and all of next weekend's fixtures - will kick-off seven minutes late in tribute to the 25th anniversary of the Hillsborough disaster. The inquest into the reasons why 96 Liverpool fans lost their lives in 1989 is ongoing and Rodgers said: "We can't say too much on Hillsborough because the inquest is under way but as a manager I knew coming into the football club that there are 96 people in the sky that will always be supporting this team. "If we are to achieve anything this year they will always be in our thoughts."